Griffith Taylor’s climographs comparing selected Australian towns with the ideal climate for the white race. Taylor’s climographs combine wet-bulb temperature and humidity data for each month of the year, producing a twelve-sided polygon for each location to allow easy comparison between them. Other climographs compiled by Taylor show the close similarity between tropical Australia and India. Griffith Taylor, ‘Geographical factors controlling the settlement of tropical Australia’, Queensland Geographical Journal, No18-19, 1918, vols 32-33. 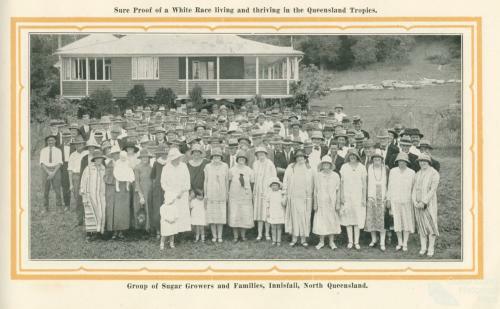 Group of sugar growers and families, Innisfail, North Queensland. Sure proof of a white race living and thriving in the Queensland tropics.